With such rapid and immense development of science and technology in the past few decades, civilization is moving towards a more “mechanical” future and surroundings, one that puts into question our relationship with nature and its inhabitants. There are many concerns in this regard and we’re seeing a lot of them even today, as we try to balance between modern technology and natural aspects. 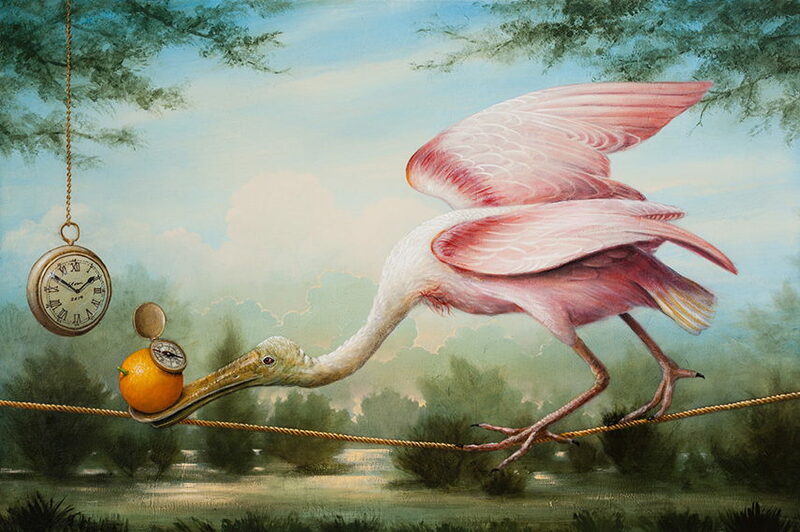 Presenting his view on the matter, Kevin Sloan’s practice consists of paintings that are widely portraying these issues and the relation between man and animal in contemporary times. In his detailed work, he looks to reconcile civilization and nature as he creates an awkward mixture of the two worlds. 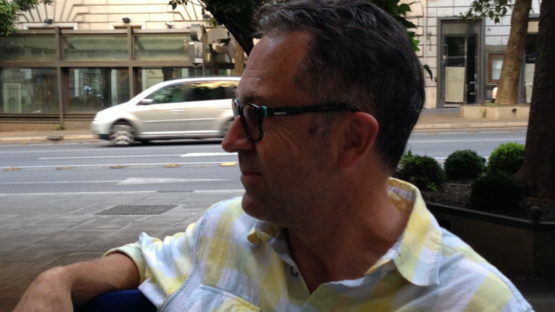 In his work, Sloan turns to the natural surroundings that pillars our technological advancement and is often at the receiving end of these breakthroughs. It could be said that he stands as an ambassador to these “silent citizens” of the Earth we all share, bringing to the forefront many issues that stand between us. Far from assaulting the modern way of life, Sloan acknowledges the contemporary society and rather creates a dialog between the two, often showing awkward, yet beautiful concoctions of what both worlds have to offer. Seeking a sort of harmony and balance, his works go back and forth between the natural and technological environment, creating a symbolical realm of realistic questions and issues. Kevin Sloan goes to great lengths when it comes to detail, to the point where his paintings can be compared to photography. With that in mind, Sloan decided to add a surreal aspect to his pieces, moving his body of work in a different direction. Permeated with an allegorical nuance, his paintings portray realistically depicted individual elements in an unrealistic setting, forcing an interaction between nature and technology. The background is often an image for itself, displaying a natural ambience in incredible detail that possibly represents an escape from the conflict depicted in the foreground. By presenting the animals and nature in conjunction with the elements out of our modern way of life, Kevin Sloan poses a lot of questions and leaves the narrative opened to interpretation and answering. These aren’t intended for big enterprises or communities; they’re for every one of us that share this common ground, individually affecting not just the current state between the two worlds, but how it will be perceived in the future. Sloan’s paintings remind us of the existence of those that cannot be heard, and they do so in an astonishing portrayal of mystery and beauty. 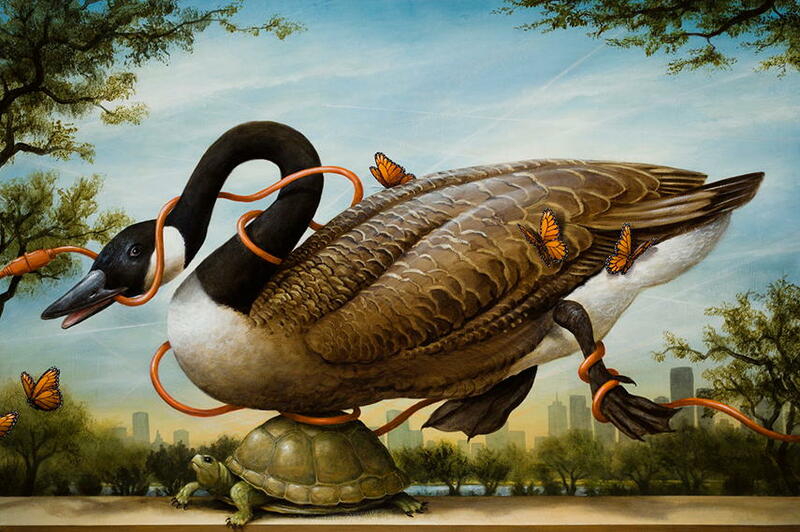 Kevin Sloan lives and works in Denver. Featured image: Kevin Sloan. All photos credit the artist.